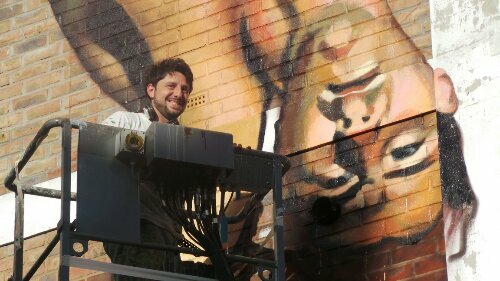 Following the success of his epic if slightly random Village Underground mural satire on the badger cull, Argentinian muralist Martin Ron has somehow managed to come across another huge spot to paint in the city. 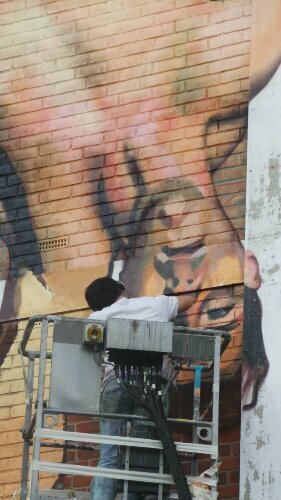 High on a cherry picker I came across Martin painting the left hand side of the famous Hanbury Street wall which currently plays host to the long standing and highly regarded ROA Crane. 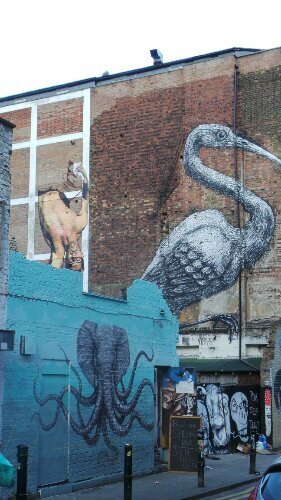 The street is renowned as only hosting the very best street artists and Ron joins the likes of Alexis Diaz, ROA, Jana & JS and DALeast all of whom currently have works on the street. 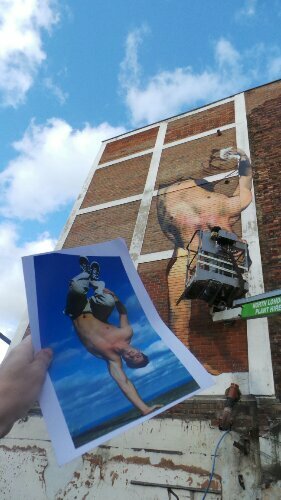 Initially depicting a half naked hand standing man, no one quite knows what goes on in Ron’s head so on initial viewing it’s hard to know in which direction the mural will go. Martin is a master of the surreal and the only constant in his work seems to be that it’s big and it’s great to look at. Returning the next day the man has acquired a bearskin cap, the type worn by the guards at Buckingham Palace and the handstand is actually a move from Capoeira, a Brazilian martial art which contains elements of dance and acrobatics. The mural depicts a guard who has been standing all day at the palace and who then suddenly rocks out at the end of his shift and decides to bust some moves. Off comes the jacket and the previously composed guard reveals a whole new side to his personality. As ever Ron has chosen a local theme for his mural. Uninspired by global issues he prefers to make his murals into something that the locals would appreciate. 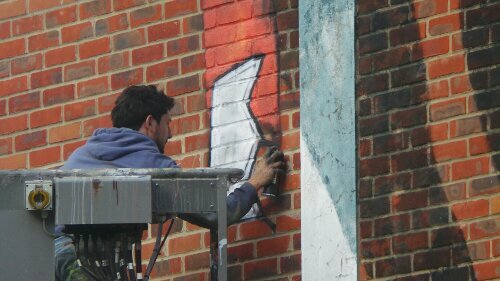 His previous mural focused on the badger cull, a little local difficulty if ever there was one, and this puts a new light onto an iconic British institution. 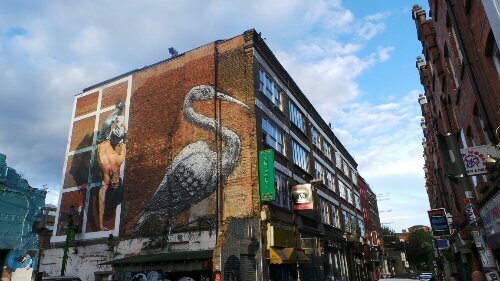 Ron’s visit to the UK has been a welcome one and his two murals have been some of the stand out art pieces from this year so as usual a few pictures are below, hope you enjoy them.